If you remember Rudy Boesch – you would know Pulau Tiga Island, located in the heart of Borneo Malaysia. For those of you who are confused, keep reading to learn more about this special place. Island is a geographical term given to a piece of land which has water on all sides. Greenland is considered to be the largest island on the earth. Australia, on the other hand is taken to be the smallest continent. There are different types of islands like the Continental Islands, Desert Islands, Oceanic Islands and Tropical Islands etc. Sometimes islands are also called by different names according to their size. Pulau Tiga Island constitutes of many small islands. Most of these small islands have never seen a footprint of man on their land. Pulau Tiga has its formation in Kimanis Bay. Way back in 1897, a big volcanic eruption was caused by an earthquake in Mindanao Philippines, near Borneo. This gave birth to present day Pulau Tiga Island. Pulau Tiga is also known as Survivor Island. It saw the makings of world famous ‘Survivor’, Reality Series starring the now famous Rudy Boesch , the oldest competitor of Survivor at the age of 72; hence thereafter people started knowing it through this earned name. Today Survivor Island is a famous haunt of visitors visiting Kuala Penyu. One can take a boat from Kuala Penyu to the Island. Normally visitors go there to spend the day. But there are others who like to stay at one of the two resorts on the Island. 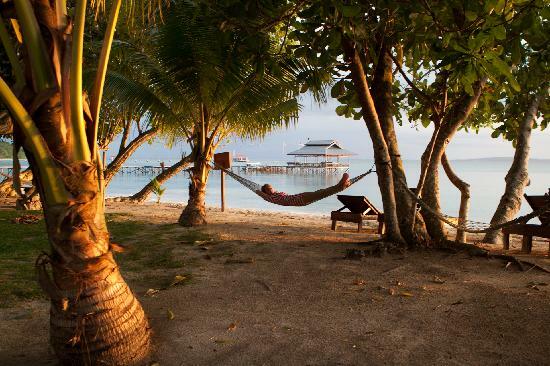 These resorts are Pulau Tiga Resort and the lovely Borneo Survivor Resort. A restaurant is also there to cater to its guests at Pulau Tiga Resort and Borneo Survivor Resort. The destination is a good choice for tropical island vacation. 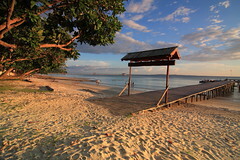 A tropical island vacation at Pulau Tiga offers a relaxing time drenched in warm sunshine. Natural volcanic mud is good for physical therapy. This natural volcanic mud is there since the formation of Pulau Tiga. Even today warm mud oozes out of many geothermal vents around the island. A day or two at the Island can be enjoyed by taking a dip in the warm clear waters that surround the place. One can snorkel or dive for fun. Lessons are available in diving for those who wish to learn. Snakes can be found in abundance around the Island. They are the natural inhabitants of this place. Apart from snakes, one can see macaque monkeys, bats, rats, monitor lizards, flying foxes, sea turtles, hornbills, and sea eagles in abundance. From the Island one can easily visit other places of interest around Sabah. These places are Rumbia Information Centre, Mataking Island, Tunku Abdul Rahman Park, Marine Park, Mabul Island, Dinawan Island, Layang-Layang Island, Libaran Island and Kapalai Island etc. A trip to the Island of Pulau Tiga is a must for all those who love nature. Been To Pulau Tiga Island? Been there, done that? Did you try out the natural volcanic mud therapy? Experienced something interesting? We would love to hear from you!